Cubital tunnel syndrome (CBTS) is a peripheral nerve compression syndrome. It is an irritation or injury of the ulnar nerve in the cubital tunnel at the elbow. This is also termed ulnar nerve entrapment and is the second most common compression neuropathy in the upper extremity after carpal tunnel syndrome. It represents a source of considerable discomfort and disability for the patient and may, in extreme, cases lead to a loss of function of the hand. Cubital tunnel syndrome is also often misdiagnosed. Cubital tunnel syndrome is a progressive entrapment neuropathy of the ulnar nerve at the medial aspect of the elbow. The ulnar nerve, which is a motor and sensory nerve, is formed from the medial cord of the brachial plexus, which originates from nerve roots C8 and T1. The ulnar nerve travels down the posterior aspect of the arm to eventually traverse posterior to the medial epicondyle through an area known as the cubital tunnel. The cubital tunnel extends from the medial epicondyle of the humerus to the olecranon process of the ulna. The nerve runs superficial to the ulnar collateral ligament (UCL) and deep to the aponeurotic attachment of the flexor carpi ulnaris (FCU), which is also known as Osborne’s ligament. Once the ulnar nerve reaches the proximal border of Osborne’s ligament it is located in the cubital tunnel. The roof of the cubital tunnel is formed by the cubital tunnel retinaculum which is about 4 mm between the medial epicondyle and the olecranon. The floor of the tunnel consists of the elbow joint capsule and the posterior band of the medial collateral ligament of the elbow. It contains several structures of which the most important is the ulnar nerve. Out of all the sites, the cubital tunnel is the most common site for entrapment. Cubital tunnel syndrome is the second most commonly reported upper extremity entrapment neuropathy and is the most common ulnar nerve neuropathy. Cubital tunnel syndrome may be a result of direct or indirect trauma due to the ulnar nerve's vulnerability to traction, friction and compression. Traction injuries may be the result of longstanding valgus deformity and flexion contractures, but are most common in throwing athletes due to extreme valgus stress placed on the arm. One of the most common pathogenetic mechanisms is intermittent traction when the ulnar nerve becomes fixed at a single or several points which limits the free gliding of the nerve. Compression of the nerve at the cubital tunnel may occur due to reactive changes at the MCL, adhesions within the tunnel, hypertrophy of the surrounding musculature, or joint changes. Secondary (symptomatic) include: a delayed ulnar paresis due to trauma or elbow arthrosis. It can also be caused by extra neural or less commonly, intraneural masses, such as a lipoma or ganglion. Direct trauma or other space occupying lesions, repetitive elbow flexion/extension, repetitive overhead activities, traction, subluxation of the ulnar nerve from the ulnar groove, metabolic disorders, congenital deformities, synovial cysts, anatomical irregularities, arthritis, joint inflammation, and occupational/athletic factors. Symptoms can sometimes be associated with other conditions such as, osteoarthritis, rheumatoid arthritis and other diseases, for example, diabetes mellitus and haemophilia and symptoms can be aggravated by alcoholism, obesity and smoking. Mild nerve dysfunction implies intermittent paraesthesia and subjective weakness. Moderate dysfunction presents with intermittent paraesthesia and measurable weakness. Severe dysfunction is characterized by persistent paraesthesia and measurable weakness. Diagnosis is established through patient history and a physical examination, in conjunction with the findings of electro-physiologic studies and imaging. Tinel’s signs are also used in the diagnostic procedure. as well as in the diagnosis of tarsal tunnel syndrome. Tests used to confirm the diagnosis of cubital tunnel syndrome are those linking ulnar neuropathy and the elbow. These tests should evoke provocative signs as a reaction to confirm the syndrome, such as: elbow flexion reproducing symptoms, positive Tinel’s sign tested at the elbow or a sign of instability, for example snapping of the ulnar nerve over the medial epicondyle with elbow flexion. Typically performed bilaterally with the shoulder in full external rotation and the elbow actively held in maximal flexion with wrist extension held for one minute. Symptoms are produced as maximal elbow flexion reduces the cubital tunnel volume by approximately 55% causing increased neural pressure on the ulnar nerve. This test can include additional components such as wrist extension and wrist flexion or sustained maximal elbow flexion for up to 3 minutes. A positive test is reproduction of pain at the medial aspect of the elbow and numbness and tingling in the ulnar distribution on the involved side. This test has a high positive predictive value (0.97), indicating a high probability of cubital tunnel syndrome if positive, with high specificity (0.99) and sensitivity (0.75). Pressure is applied to the ulnar nerve at the cubital tunnel with the UE positioned as in the elbow flexion test for 30 seconds. Sensitivity with this test is high (0.91). The patient’s skin is lightly scratched over the area of nerve compression whilst resisted bilateral shoulder external rotation is performed. A brief loss of muscle resistance will be elicited if the patient has allodynia due to compression neuropathy. Sensitivity for the scratch collapse is 69% compared with 54% and 46% for the Tinel test and elbow flexion compression test, respectively. Of all tests for cubital tunnel, the Tinel test has the highest negative predictive value (98%). worsening of the objective findings on follow up several weeks after the initial visit. A release of Osborne’s ligament through an incision traversing in a proximal to distal direction throughout the length of the ligament increasing the space in the cubital tunnel. A 6 to 10cm incision is made along the course of the ulnar nerve between the medial epicondyle and the olecranon. Care should be taken to avoid the branches of the medial antebrachial cutaneous nerve. Osbourne’s ligament is released as are the FCU superficial and deep fascia. It has been shown to be successful in treating cubital tunnel syndrome. Data suggests that in situ decompression is a reliable treatment with a low failure rate and anterior trans-positioning can be used to treat those patients with recurrent symptoms. Decompression is the most commonly performed surgical treatment. It can be done in conjunction with a medial epicondylectomy. An incision is made in a proximal to distal direction parallel to the ulnar nerve. The incision exposes the roof of the nerve and the medial epicondyle. The aponeurotic origin of the flexor mass is then dissected allowing partial excision of the epicondyle. The UCL is not compromised in this procedure and it can be done in addition to the simple decompression. Geutjens et al. found limited evidence to show that the medial anterior epicondylectomy offers a significantly better pain score than the ulnar nerve transposition in the treatment of cubital tunnel syndrome at long-term follow-up. A longitudinal curvilinear incision is made anterior to the medial epicondyle penetrating the roof to expose the nerve. A portion of the medial intermuscular septum is excised which normally provides protection for the ulnar nerve; however, it must be removed in order to expose the nerve for transposition. At the area where the nerve enters the forearm fascia (cubital tunnel), the flexor carpi ulnaris aponeurosis and the deep flexor-pronator aponeurosis are dissected and the nerve is removed from the ulnar groove and moved into the anterior aspect of the arm. Adipose tissue is then sutured from the anterior flap to the medial epicondyle to prevent the nerve from slipping back into the ulnar groove. Results found no difference in motor nerve conduction velocities or clinical outcome scores, however, between simple decompression and ulnar nerve transposition. Subcutaneous (above) - the goal is to move the ulnar nerve anterior to the elbow axis of flexion, decreasing the tension on the nerve. Intramuscular (within) - proponents of this technique believe that this places the nerve in a straighter line across the elbow joint. Opponents argue that scarring of the nerve can be caused, which serves as the bed for the transposed nerve. The procedure is similar to the subcutaneous trans-positioning, however, a groove is created in the flexor-pronator muscle mass to serve as a tract into which the nerve is transposed. 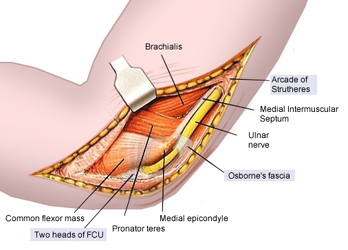 Submuscular (below) - some surgeons prefer to place the nerve completely beneath the flexor-pronator mass. The branches of the medial antebrachial cutaneous nerve are identified and protected. The ulnar nerve is identified and decompressed as in subcutaneous trans-positioning. Selecting a particular surgical approach is based on the etiology of nerve compression, anatomic variations and the surgeon’s experience. With careful protection of the medial antebrachial cutaneous nerve and careful complete decompression of the nerve around the elbow, with or without transposition, good results can be obtained. Conservative treatment has been shown to have a 90% success rate in acute ulnar irritation with symptoms often resolving within 2-3 months. A nonsurgical approach should be followed for at least a 3 month period before considering a surgical intervention, especially with mild cases. Conservative treatment may include: a 4-6 week period of immobilisation with the elbow splinted at 45 degrees of flexion and the forearm in neutral rotation, activity modification, electrotherapy modalities, anti-inflammatories, soft elbow pads, joint mobilisations, neural flossing , neural gliding , exercise and patient education. Active rest is recommended for athletes. 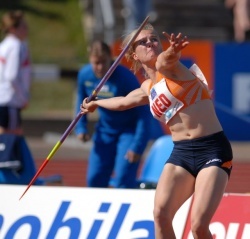 Return to throwing is allowed at 4-6 weeks following absence of symptoms with daily activities or exercise and return to full ROM and strength. While there is strong evidence in support of splinting (Figure 2), activity modification and patient education, only low level evidence supports manual techniques such as nerve glides, joint mobilisations and manipulation and exercise. Despite the low level evidence, improvements have still been seen with manual techniques in patients with cubital tunnel syndrome. The initial goal of conservative treatment for cubital tunnel syndrome is to control and decrease paraesthesia and pain. When symptoms are mild and aggravating activities can be identified, the first step is to eliminate those pain provoking activities. When symptoms occur in a wider range of activities such as work, therapy becomes more complex and can consist of activity modifications, splinting and rest. With this combination, pain and paraesthesia become more controllable. Therapy begins with education about the development of symptoms and how certain activities can influence those symptoms. such as stretching or compressing the nerve when collaterally tilting the head or abducting, depressing or externally rotating the shoulder, supinating the forearm or extending the wrist. The patient is educated about pain provoking movements and how best to avoid them in ADLs, which could cause aggravation of the symptoms. For many patients this could mean lifelong management. Studies show that the effect of rigid night splinting for a period of three months combined with activity modification appears to be successful. Prolonged elbow flexion (static or repetitive) puts strain on the ulnar nerve and increases extraneural and intraneural pressure in the cubital tunnel. The lowest value of these pressures is at an elbow position of 40-50 degrees of flexion. Pressures are significantly higher in full flexion or extension of the elbow. 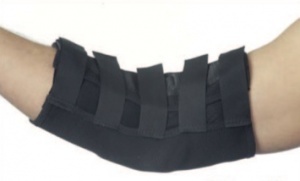 Splinting is designed to alleviate symptoms and prevent the progressive dysfunction of nerves. Two issues that should be considered however, the ability of the splint to maintain the elbow at the ideal amount of flexion and patient compliance with night splinting. As well as education, immobilising the elbow with splints can reduce swelling and can help to identify the location of nerve irritation. Splinting the elbow in an appropriate way allows the nerve and the surrounding structures to rest and have relief from traction and compression. This method can be combined with local steroid injections for the relief of pain and swelling. Though steroid injections can have positive effects, caution has be used to avoid complications such as scarring and atrophy. Avoiding symptom provoking activities can be the most important aspect in treating cubital tunnel syndrome, although this may mean a cessation of work. Creating an effective treatment plan is challenging for professionals as the recovery period of nerves can be unpredictable. Ice application may also help to reduce pain and swelling and can be combined with gently applied active range of motion exercises. Ultrasound therapy is also an option, but only when used appropriately and with caution as it is also shown to cause further nerve damage when used at an inappropriate intensity, slowing the speed of recovery. Active range of motion exercises should be initiated within range of comfort, with stretching also within tolerance and only after pain levels have decreased. Cervical Radiculopathy C8-T1: Motor and sensory deficits in a dermatomal pattern including 4th-5th digits, associated weakness of intrinsic muscles of the hand, and associated painful and often limited cervical range of motion. Thoracic Outlet Syndrome: Compression of the structures of the brachial plexus potentially leading to pain, paresthesias, and weakness in arm, shoulder, and neck. UCL Insufficiency: Laxity of the UCL can lead to excessive or abnormal movement of structures in or around the cubital tunnel creating new sites of compression. Pancoast Tumor: Abnormal growth of tissue on the apex of the lung causing compression of the lower trunk of the brachial plexus. Early diagnosis is essential for improved recovery, as improvement rates are higher (88%) when treated within one year of onset as opposed to 67% improvement if treated after one year. Medium RCT using three groups to compare effectiveness of elbow night splinting, self-nerve glides, and a control. A 3-month period of self-nerve gliding and instruction about the anatomy of the cubital tunnel including information about provocative positions in those with cubital tunnel syndrome resulted in increased pain-free grip strength, decreased daytime pain, and “normalized” EMG studies but was not significantly different from night splinting with instruction or instruction alone. Conclusion: All groups showed statistically significant improvements in COPM scores and night pain compared to baseline, as well as improvements in grip strength, 5th digit adduction power, and EMG studies but these changes did not reflect a statistically significant change. The objective was to discuss the diagnosis and treatment of a patient with cubital tunnel syndrome and to illustrate novel treatment modalities for the ulnar nerve and its surrounding structures and target tissues. The patient was a 17 year old female with traumatic onset of cubital tunnel syndrome. She had pain around the elbow and paresthesia in the ulnar nerve distribution. Electrodiagnostic tests were negative. Segmental cervicothoracic motion dysfunctions were present which were regarded as contributing factors hindering natural recovery. Six treatments included nerve-gliding techniques, segmental joint manipulation, and a home program of nerve gliding and light free-weight exercises. Substantial improvement was recorded on both the impairment and functional level. Symptoms did not recur within 10-month follow-up period. Pain and disability had completely resolved. Despite the significant amount of literature devoted to the diagnosis and treatment of cubital tunnel syndrome, optimal treatment often requires two very simple components of treatment - time and rest. While surgical intervention can greatly ease symptoms, successful lifelong management of cubital tunnel syndrome also demands education and a dedicated effort at activity modification. Hopefully, with better environmental work conditions and early detection, can the expenses involved, the time spent in rehabilitation and most importantly the pain and disability patients experience decrease with the help of the patient, employers and the medical management team. ↑ 1.0 1.1 1.2 1.3 1.4 1.5 Palmer BA, Hughes TB. Cubital Tunnel Syndrome. J Hand Surg. 2010; 35(1): 153–163. ↑ 3.0 3.1 3.2 Cutts S. Cubital tunnel syndrome. Postgrad Med J. 2007; 83(975): 28–31. ↑ 4.0 4.1 4.2 4.3 4.4 4.5 4.6 Assmus H, Antoniadis G, Bischoff C. Carpal and cubital tunnel and other, rarer nerve compression syndromes. Dtsch Arztebl Int. 2015;112(1-2):14-25; quiz 26. ↑ 5.0 5.1 5.2 5.3 5.4 5.5 5.6 5.7 5.8 5.9 Lund AT, Amadio PC. Treatment of cubital tunnel syndrome: perspectives for the therapist. J Hand Ther. 2006;19(2):170-8. ↑ Rinkel WD, Schreuders TA, Koes BW, Huisstede BM. Current evidence for effectiveness of interventions for cubital tunnel syndrome, radial tunnel syndrome, instability, or bursitis of the elbow: a systematic review. Clin J Pain. 2013;29(12):1087-96. ↑ Feindel W, Stratford J. Cubital tunnel compression in tardy ulnar nerve palsy. Can Med Assoc J. 1958;78:351. ↑ Osborne GV. The surgical treatment of tardy ulnar neuritis. J Bone Joint Surg Br. 1957;39B:782. ↑ 9.0 9.1 9.2 9.3 Tetro AM, Pichora DR. Cubital tunnel syndrome and the painful upper extremity. Hand Clin. 1996;12(4):665-677. ↑ Wheeless CR. Cubital tunnel syndrome. http://www.wheelessonline.com/ortho/cubital_tunnel_syndrome. Updated June 5, 2010. Accessed November 1, 2010. ↑ 11.0 11.1 11.2 11.3 11.4 Coppieters MW, Bartholomeeusen KE, Stappaerts KH. Incorporating nerve-gliding techniques in the conservative treatment of cubital tunnel syndrome. J Manip Physiol Ther. 2004;27(9):560-568. ↑ 12.0 12.1 12.2 12.3 Kuschner SH, Ebramzadeh E, Mitchell S. Evaluation of elbow flexion and tinel tests for cubital tunnel syndrome in asymptomatic individuals. Orthopedics. 2006;29(4):305-308. ↑ Lee ML, Rosenwasser MP. Chronic elbow instability. Orthop Coin North Am. 1999;30:81-89. ↑ Aldridge JW, Bruno RJ, Strauch RJ, Rosenwasser MP. Nerve entrapment in athletes. Clin Sports Med. 2001;20:95-122. ↑ Uscetin I, Bingol D, Ozkaya O, Orman C, Akan M. Ulnar nerve compression at the elbow caused by the epitrochleoanconeus muscle: a case report and surgical approach. Turk Neurosurg. 2014; 24(2):266-71. ↑ 16.0 16.1 16.2 16.3 Bruce SL, Wasielewski N, Hawke RL. Cubital tunnel syndrome in a collegiate wrestler: a case report. J Athl Train. 1997;32(2):151-4. ↑ Bartels RHMA, Verbeek ALM. Risk factors for ulnar nerve compression at the elbow: a case control study. Acta Neurochir Wien. 2007;149:669-674. ↑ Oskay D, Meriç A, Kirdi N, Firat T, Ayhan Ç, Leblebicioglu G. Neurodynamic mobilization in the conservative treatment of cubital tunnel syndrome: long-term follow-up of 7 cases. J Manip Physiol Ther. 2010;33(2):156-163. ↑ 20.0 20.1 20.2 Wojewnik B, Bindra R. Cubital tunnel syndrome - Review of current literature on causes, diagnosis and treatment. J Hand Microsurg. 2009; 1(2):76-81. ↑ 23.0 23.1 Qing C, Zhang J, Wu S, Ling Z, Wang S, Li H. Clinical classification and treatment of cubital tunnel syndrome. Exp Ther Med. 2014;8(5):1365-1370. ↑ Watanabe M, Arita S, Hashizume H, Honda M, Nishida K, Ozaki T. Multiple regression analysis for grading and prognosis of cubital tunnel syndrome: assessment of Akahori's classification. Acta Med Okayama. 2013;67(1):35-44. ↑ 25.0 25.1 25.2 Zlowodzki M, Chan S, Bhandari M, Kalliamen L, Schubert W. Anterior transpositin compared with simple decompressin for treatment of cubital tunnel syndrome. J Bone Joint Surg Am. 2007;89:2591-8. ↑ 26.0 26.1 26.2 26.3 Shah CM, Calfee RP, Gelberman RH, CA Goldfarb. Outcomes of Rigid Night Splinting and Activity Modification in the Treatment of Cubital Tunnel Syndrome. J Hand Surg. 2013; 38(6): 1125–1130. ↑ Boucher B, Wainner R, Robertson E. Common disorders of the elbow-forearm complex: part II. Paper presented at: Texas State University DPT PT7559 Lecture; 2010; San Marcos, TX. ↑ Behr CT, Altchek DW. The elbow. Clin Sports Med. 1997;16:681-704. ↑ 34.0 34.1 34.2 Novak CB, Lee GW, Mackinnon SE, Lay L. Provacative testing for cubital tunnel syndrome. J Hand Surg Am. 1994;19:817-820. ↑ Neal SL, Fields KB. Peripheral nerve entrapment and injury in the upper extremity. Am Fam Physician. 2010;81(2):147-155. ↑ Yamamoto K, Shishido T, Masaoka T, Katori Y, Tanaka S. Postoperative clinical results in cubital tunnel syndrome. Orthopedics. 2006;29(4):347-353. ↑ Geutjens GG, Langstaff RJ, Smith NJ, Jefferson D, Howell CJ, Barton NJ. Medial epicondylectomy or ulnar-nerve transposition for ulnar neuropathy at the elbow? J Bone Joint Surg Br. 1996;78(5):777-9. ↑ Eaton RG, Crowe JF, Parkes JC. Anterior transposition of the ulnar nerve using a non-compressing fasciodermal sling. J Bone Joint Surg Am. 1980;62:820-825. ↑ 40.0 40.1 Shrivastava N, Szabo, RM. Decision making in upper extremity entrapment neuropathies. The Journal of Musculoskeletal Medicine, 2008;25(6), 278-280,284-285,288-289. ↑ Optimum Care Providers. 8.1 Upper Limb Ulnar Nerve Mobility. http://www.youtube.com/user/OptimumCareProviders#p/u/107/WtH2QOuwuCU. Updated May 5, 2009. Accessed November 1, 2010. ↑ Optimum Care Providers. 8.2 Upper Limb Ulnar Nerve Mobility. http://www.youtube.com/user/OptimumCareProviders#p/u/108/IlrJ7Ibop_4. Updated May 5, 2009. Accessed November 1, 2010. ↑ 43.0 43.1 Office of Communications and Public Liaison. NINDS Thoracic Outlet Syndrome Information Page. http://www.ninds.nih.gov/disorders/thoracic/thoracic.htm. Updated July 14, 2010. Accessed November 1, 2010. ↑ 44.0 44.1 44.2 Svernlov B, Larsson M, Rehn K, Adolfsson L. Conservative treatment of the cubital tunnel syndrome. J Hand Surg Eur 2009;34E(2):201-207. ↑ Galarza M, Gazzeri R, Gazzeri G, Zuccarello M, Taha J. Cubital tunnel surgery in patients with cervical radiculopathy: double crush syndrome?. Neurosurg Rev. 2009;32(4):471-478. ↑ Chan RC, Paine KWE, Varughese G. Ulnar neuropathy at the elbow: comparison of simple decompression and anterior transfer. Neurosurgery. 1980;7:545-550.